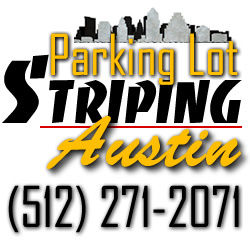 Parking Lot Striping Austin is the only place to call when you need to stripe your brand new parking lot, or freshen up/re-stripe your existing lot. We are the premier full service parking lot service company in Texas. You will receive the very best quality paint materials which are fast drying, tough, long lasting, and compliant. Match the quality of our materials with our professional service and application techniques, and your parking lot (asphalt or concrete) will look better than ever before. 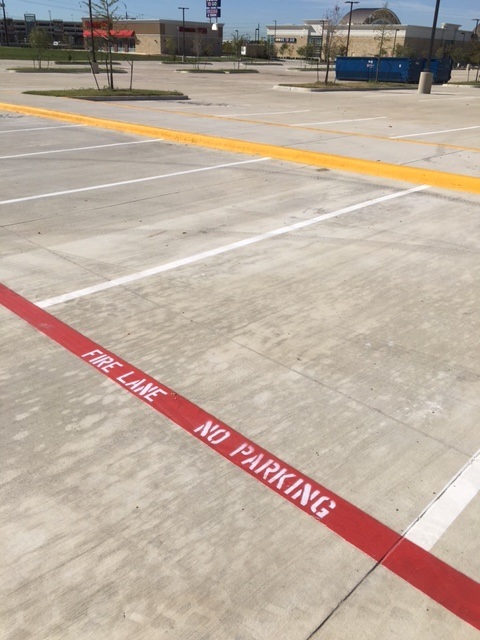 Look no further if you desire the number one asphalt striping resource service in the entire Austin metro area to entrust to painting straight lines in your parking lot. There is no other company you should call for any and all pavement marking needs. Our mission is to keep your parking lot compliant, looking professional and immaculate. We are aware that having a fresh and clean parking lot not only looks nice, but shows your customers and visitors that you care about their safety as well. 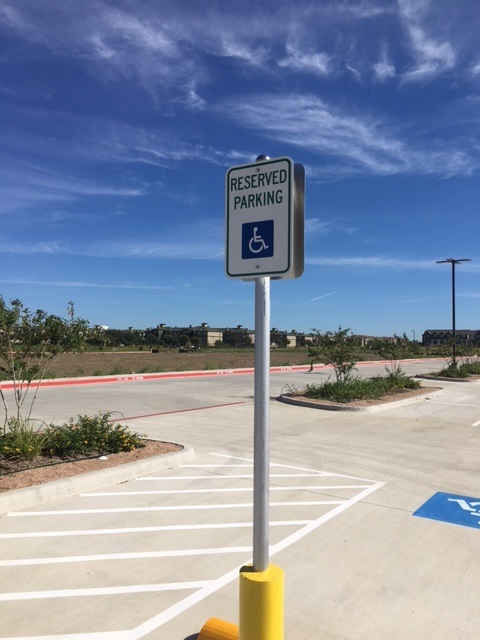 When your parking spaces, fire lanes, handicapped areas, no parking zones, and loading zones are clearly marked, your visitors can safely travel in the lot and feel safe. Not only does this ensure their safety, but having a clean lot is the best way for you to make the very best first impression. Learning to stripe accurate straight lines takes time, experience, and skill. Our professionals, possess these skills, and we are proud to say that we paint straighter lines than other companies in the area. We also ensure that your pavement markings are accurately placed and stay uniform and consistent in both width and color. In order to ensure we do not disrupt your normal flow business, we work directly with property manager, business owners, and general contractors to meet deadlines and complete the job in a time frame that is best for your business. 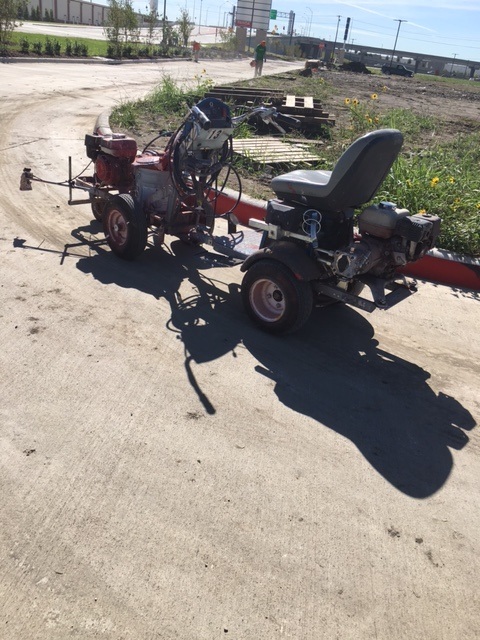 ​Being a full service parking lot service and maintenance company we provide your company with a one-stop solution for all your pavement striping and painting needs. Accurately marked, easily visible fire lanes are very important for safety and compliance. Trying to understand all of the different city codes can be overwhelming. Never fear we have you covered. 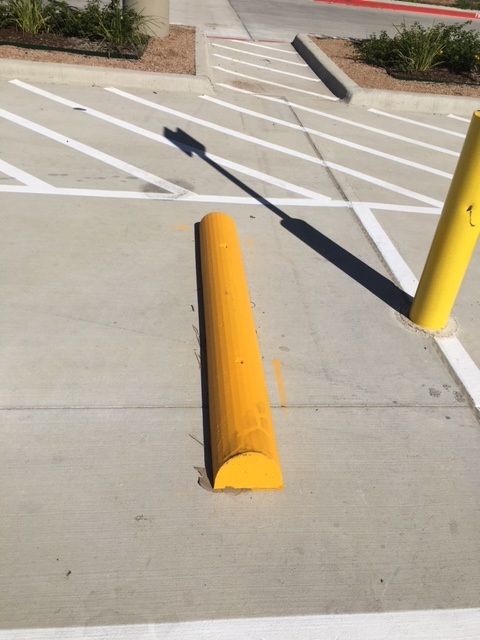 We understand each city code and make sure your parking lot stays compliant. We follow the city codes laid out by each specific city and maintain safety by clearly marking the fire lane areas of your lot. The American Disabilities Act (ADA) requires that every business have a mandatory amount of handicap accessible parking spaces available based on the number of parking spaces per every 1,000 sq. ft. of utilized parking space in the lot. 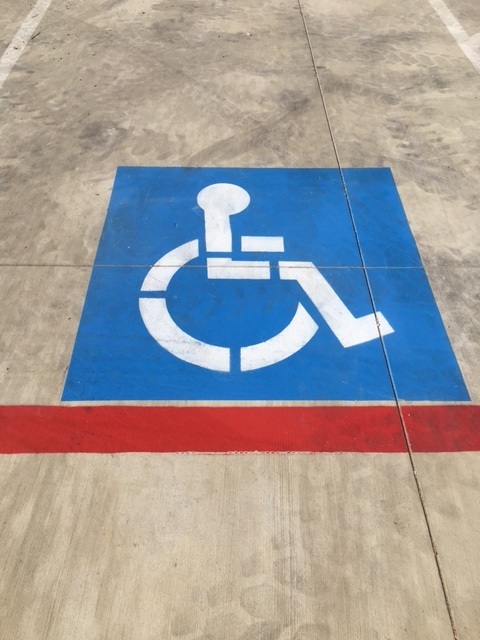 Depending on the size of the parking lot, you may also be required to have a designated handicap van accessible area as well. Never fear we will make sure you understand the requirements and will advise you accordingly based on the size of your actual parking lot area. You may or may not have wheels stops installed in your parking lot. Either you love them or you hate them seems to be the consensus. Wheel stops are most often installed to prevent vehicles from causing damage to buildings, walls or other vehicles. They are also used as a less expensive alternative to installing curbs around a property or walkway. We do offer installation and removal services for wheel stops. No matter your preference or requirements we can assist you with wheel stops. We can also paint and stencil the wheel stops as required. You do want to make sure the wheel stops are highly visible and maintained to prevent injury related to tripping and falling by pedestrians walking in the parking lot. Controlling traffic speeds inside your parking lot is a huge deal when it comes to safety for the visitors of your business. The size of your lot will determine if speed bumps are necessary. If you do happen to have speed bumps you will need to make sure they also stay highly visible, and maintained. 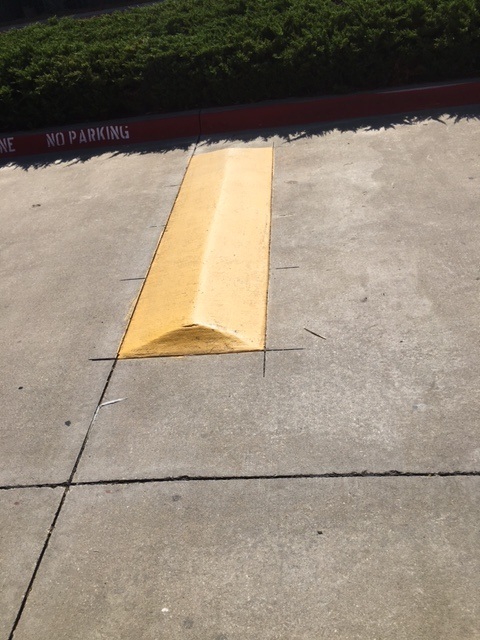 Just like wheel stops, speed bumps can be very easy to trip over causing personal injury in a parking lot. As much as you do not want pedestrians to trip over them, you also do not want vehicles to hit them at rapid speeds and cause damages to their vehicle or others. Depending on the material of your speed bumps, we can either paint them so they are very noticeable, to both pedestrians and vehicles, or install new ones for you. 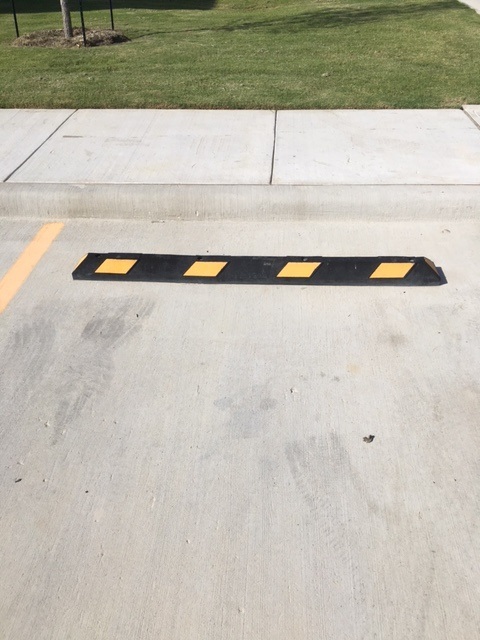 If you do not have speed bumps but need them, we can professionally install these for you. We are experienced with asphalt, rubber, and plastic speed bumps. As we walk through your needs, we will help you determine the best needs for your business. Since you are giving your parking lot an update, why not update your signage as well. We can assist you with any metal signage that is needed in your parking lot area. ​Keeping traffic flowing in the correct directions and keeping visitors informed with signs is one of the best ways to keep your lot as safe as possible, and compliant as well. We service both residential and commercial clients. Pressure washing is the most efficient method for removing loose and flaking paint, surface dirt, mold, mildew, grease, grim, gum, and any other materials that may collect on your parking lot. Cleaning your property is necessary for continue proper maintenance. Not only are you giving your property excellent curb appeal which will help attract more customers, but you are also extending the life of your property. Just like any structure your parking lot does need cleaning over time as all of the elements can really reduce the life, and appearance. Proper care and maintenance will give your property the continued face-lift to keep it clean and inviting. Striping Parking Lot Cost is it Affordable? We would love to provide you with a FREE competitive quote to strip your parking lot. No job is too large or too small, and we would be honored to provide this valuable service for your business. We pride ourselves in having the most competitive prices in the Austin Metro area, and the across the entire region. Our number one goal is customer satisfaction while providing you with the professional service you deserve. Your parking lot does not have to cost you a fortune, but we can come clean it up and make it look like a million bucks. Your customers and visitors will be amazed at your awesome looking lot. Make that first impression and give us a call today. 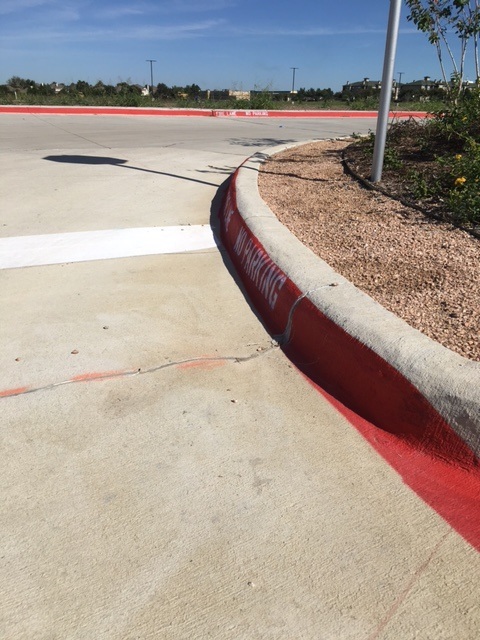 Our extreme knowledge and training regarding parking lot maintenance and pavement striping has made us the leaders in all of Austin and surrounding areas. We employ the best methods and techniques, and stay up-to-date on the latest techniques and equipment. Add all of this together and it enables us to provide the best solutions available for all of our clients. 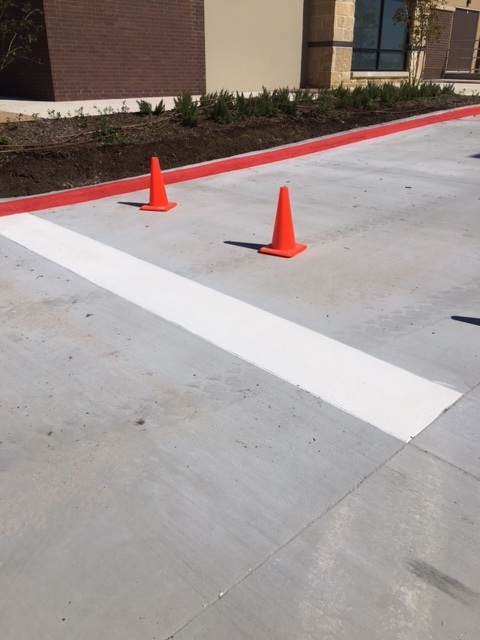 If you have a brand new parking lot, we will lay it out and make it look spectacular with fresh lines, and signage. If you have an existing lot, we will bring it back to life, and make it safe and look good as new. No matter the type of business you have, as long as you have a parking lot, or a surface that needs lines painted, we can assist. Here are some of the most common places we work with on a daily basis. If you live outside one of these areas, we would still love to help you out. ​Contact us with a call or email and we will work out the logistics with you.